Here’s your proof. I called it. I am bragging. That’s not an admirable quality. I can accept that. Yesterday, and I have to post this when “yesterday” is still yesterday, I responded to my cousin’s Facebook post about the game. It was more than two hours before kickoff. Maybe it was because I was sitting in church that I felt so accurately inspired, but it was accurate nonetheless. 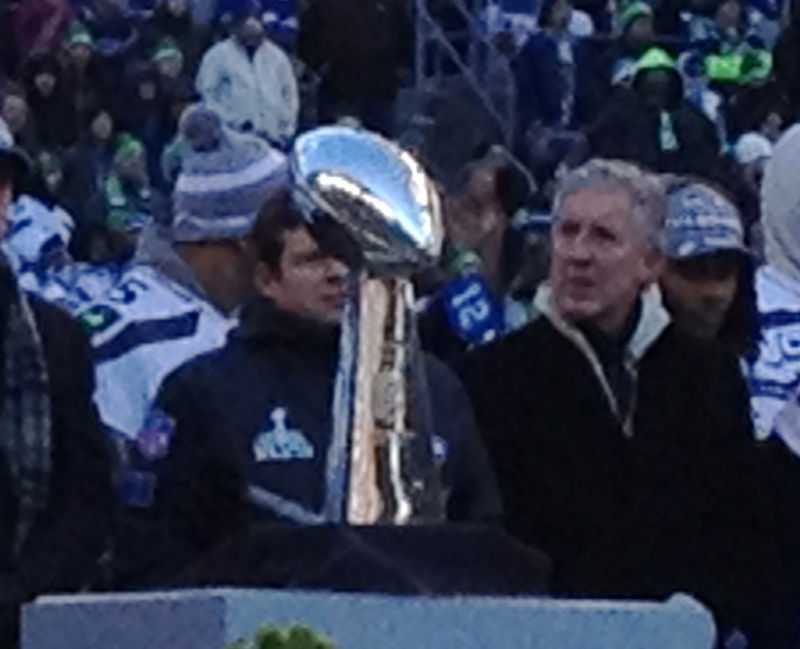 I said something few outside the Seahawks’ locker room were willing to say, that Super Bowl XLVIII would be a rout. The picture here is your proof. “Hawks will win and it won’t be close,” I wrote. In reality it was just a feeling, but I had thought about the game like everyone else had for the two weeks leading up to it and there was some logic to it. And even though I can profess some prescience, I didn’t think it be as brutal as it was. Here were my three reasons my feeling was supported by evidence. 1. As highly regarded as the Denver Broncos offense was, it only put up 26 points on the Patriots and 24 on the Chargers. The top four scoring defenses were in the NFC (Seattle, San Francisco, Carolina and New Orleans.) New England ranked 10th and San Diego was 11th. Those are good, but not elite like Seattle and San Francisco. Seattle had given up 14.4 points per game. New England and San Diego both averaged around 21. 2. I thought the difference would be the Seahawk offense. I figured Russell Wilson would play well, that Denver would have little answer for his ability to escape and find opportunities, and that Percy Harvin might play an even bigger role in the offense than he did. Denver’s defense gave up almost 25 points per game this year. That might be a little misleading, because when your offense is explosive as much as Denver’s had been, you’re on the field a lot longer and many points come in garbage time. But I thought Seattle’s offense would fare well, because it put up 23 on San Francisco and New Orleans, two vastly superior defenses. 3. In 2006 the Seahawks should have beaten the Steelers. Seattle was better than Pittsburgh, but played poorly. 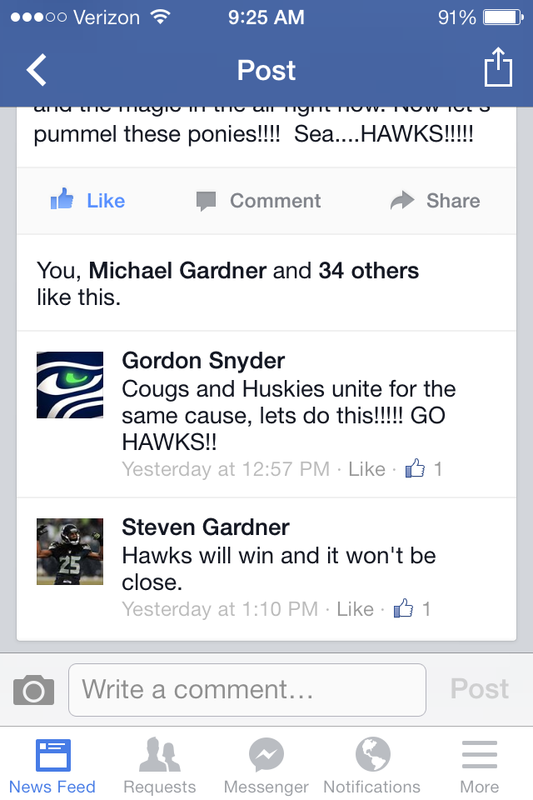 Yes, I know the refs didn’t perform so well either, but that loss was clearly on the Seahawk players. They played awful, awful, awful in key moments. I trusted the psychological make-up of this team to not implode like that one did. Perhaps what convinced me of this team’s mettle was the way it battled back against San Francisco in the NFC championship game. Wilson fumbles and the defense holds for just a field goal. Then the D figures out how to contain Kaepernick. This team was tested in a way that 2006 team was not before the Super Bowl, and it answered. I figured it would again, if necessary, but that it probably wouldn’t be to near the degree the test the 49ers presented. Despite all that, I did not envision this kind of blowout. Another cousin was in a pool and had the number “3” for the Seahawks and “4” for the Broncos. I wrote to him, 33-14 Seahawks. That’s what I figured, that the Seahawks would clearly be better than the Broncos, but that they would have to preserve a lead, not start sending in backups for mop-up duty. In the end, though, they did everything right, the refs were a non-factor and the Broncos contributed with a few mistakes. The Seahawk defense stopped the yards after catch. Manning couldn’t run like Kaepernick. The defensive line altered throws and one turned into a pick six. Harvin broke a kickoff return, something you could realistically imagine but not predict. And Seattle’s offense kept converting on third down and breaking tackles. Even I had no idea how right I would be.